This excerpt from the book The Creative Community Builder's Handbook: How to Transform Communities Using Local Assets, Arts and Culture (2007 Fieldstone Alliance), makes a compelling case that cultural projects are not simply a luxury but play a fundamental role in reviving the fortunes and boosting the prospects of poor, minority and other disadvantaged communities. Civic institutions, like museums, public galleries, community art organizations, performing art institutions, arts councils and public arts organizations have a rare opportunity to lead significant change by engaging specific groups to help devise and carry out creative community-building neighborhood programs. But it needn't always be the institution that takes action. The selected stories shown below offer inspiring examples of how individual artists can also make a difference. Tom Borrup was director of the innovative Intermedia Arts in Minneapolis for more than 20 years, and is a nationally recognized leader in cultural and community development work. He wrote this book with Partnership for Livable Communities. The Creative Community Builder's Handbook can be ordered from the publisher, Fieldstone Alliance. For more information see www.communityandculture.com or www.livable.com. The links between the economic health of a community and the quality of its social bonds are becoming increasingly clear. Robert Putnam and other sociologists have supplied convincing evidence that strong social connections are necessary ingredients of economic success. In looking for the ingredients that affect the physical well-being of people in different kinds of places, Dr. Felton Earls, a Harvard professor of public health, conducted an extensive, fifteen-year study in neighborhoods across Chicago. His research found that the single-most important factor differentiating levels of health from one neighborhood to the next was what he called "collective efficacy." He was surprised to find that it wasn't wealth, access to healthcare, crime, or some more tangible factor that topped the list. A more elusive ingredient--the capacity of people to act together on matters of common interest--made a greater difference in the health and well-being of individuals and neighborhoods. The communities profiled here found opportunities for people to come together in creation and celebration of culture. They developed their social capital by cooperating, sharing, and seeking and finding shared goals, and by developing ties on a cultural level. These connections serve these communities well in their other endeavors--from economic development to civic participation to healthy living. Public spaces and marketplaces are essential ingredients in every community. Public space provides opportunities for people to meet and be exposed to a variety of neighbors. These meetings often take place by chance, but they also can come through active organizing. The art of promoting constructive interaction among people in public spaces has been nearly forgotten in many communities. Planners, architects, and public administrators have focused more on creating aesthetic places and on providing for the unimpeded movement and storage of automobiles than on creating places that encourage social interaction. More recently, public officials have been even more concerned with security and maximizing their ability to observe and control people in public spaces. William H. Whyte asserted that crowded, pedestrian-friendly, active spaces are safer, more economically productive, and more conducive to healthy civic communities. "What attracts people most, it would appear, is other people," he wrote. Since the 1950s, city planners, developers, policy makers, and transportation engineers have built and modified communities in just the opposite vein. While the design of public space influences its use, Project for Public Spaces notes that 80 percent of the success of a public space is the result of its "management," referring to how the space is maintained and activities programmed. In other words, even in the best-designed spaces for public interaction, activities need to be planned, and the space needs to be clean, secure, and well maintained, or it is unlikely to serve people well. Public art administrators and cultural planners of all kinds can be significant players in designing, managing, and programming public space. Increasingly, artists are being tapped to collaborate with architects, landscape architects, engineers, and city planners in the design and creation of public spaces, buildings, roads, highways, and public transit facilities. As important as the space, piece of art, or event is the process by which it is created. A puppet parade may simply be a group of artists marching in the street, or it may be the result of a lengthy, community-wide process involving hundreds of residents who brainstorm themes, construct and paint the puppets, plan the activities, and march together with their families and neighbors. WaterFire, a public art event in Providence, Rhode Island, brings unprecedented numbers of people together on a regular basis to share a profound experience. At the same time it instills pride, belonging, interaction, and human connection. Created by a public artist, WaterFire involves hundreds of volunteers and supporters, and it has become part of the community's collective identity. Built at the convergence of two rivers, Providence covered its polluted downtown waterways in the 1950s with roads, rail yards, and expanded parking lots. In the early 1990s, the city uncovered, or "daylighted," the rivers and lined them with public promenades and pedestrian-friendly parks. WaterFire, a public art event that takes place on the downtown waterways, became the needed catalyst for revitalization. The event involves music, performances, ceremonial bonfires, boats, and ritual and, when it is staged, transforms nearly one mile of Providence's downtown. One hundred fire baskets, or braziers, are placed at regular intervals in waterways that wind through the center of downtown. Filled with fragrant local firewood and set ablaze at dusk, they're fed late into the night by black-garbed "fire tenders" who make their way from fire to fire in small boats. Powerful and mesmerizing music, conducted through an elaborate speaker system, seems to emanate from the flames. Artist Barnaby Evans conceived WaterFire as a one-time event in 1994, but citizens immediately recognized the power of Evans' spectacle, in which fire evoked a ritual feel and the flames symbolized the renaissance of the city. Their support, seconded by the city's mayor, led to the institutionalization of WaterFire as a community ritual in 1997. 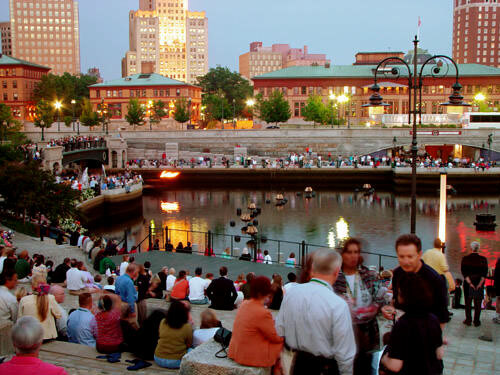 Evans created WaterFire Providence in 1997 as a nonprofit organization to carry on the public art event. Today, twenty-five events, or "lightings," are held each year, spring through fall. Each event attracts as many as 100,000 people to downtown Providence's public spaces. Multiple partnerships with social service, education, arts, and civic groups help promote other causes through the event and provide a steady stream of volunteers, weaving a fabric of community through multiple levels of participation. Visitors now come from around the world, and local residents volunteer for and attend the event again and again. By working across public, business, and nonprofit sectors, the city revived its economy. Perhaps more importantly, WaterFire boosted the community's spirit and self-image beyond what anyone could have imagined. Creating the kind of connections between people that lead to collective civic action is a challenge for any planner, organizer, or community builder. It?s a lot of hard work and there's no secret formula, but it's an essential ingredient in a democratic society. Annual or seasonal events such as festivals or farmers markets can be especially effective in communities with great social, ethnic, and economic diversity. The processes used to plan and carry out these events are at least as important as the events themselves. Planners and a multitude of artists involved in the Delray Beach Cultural Loop found inventive ways to connect a wide range of people for the first time through community-based cultural organizations. This process crossed ethnic boundaries and helped people celebrate together in a rapidly growing area of south Florida. Situated on the Atlantic coast near Palm Beach, Delray Beach is an unusually diverse suburban community. There are numerous arts and cultural organizations in the community that offer exhibitions, performances, and classes and an equal number of historic groups and sites. Many churches and other places of importance serve as sites for ritual, ceremony, and social activity. 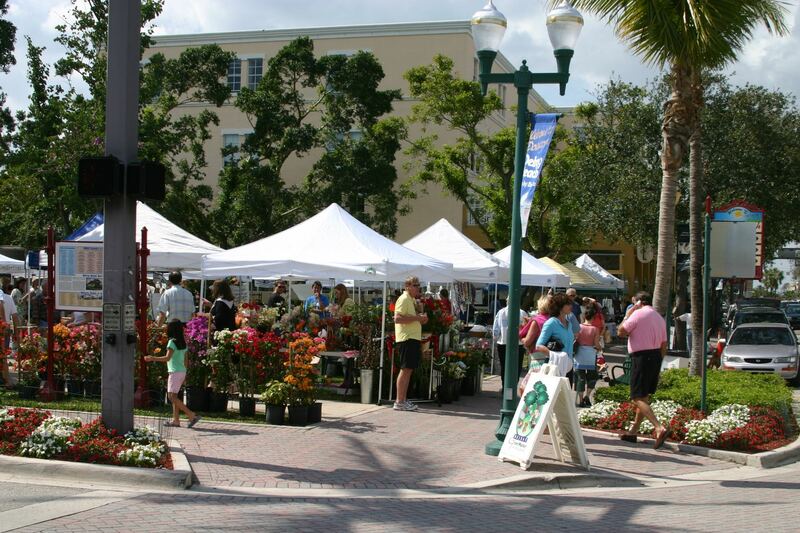 The Delray Cultural Loop and History Trail began as a one-time event on a weekend in November 2003. It consisted of a 1.3-mile rectangular route that led participants to sites representing all the city's major ethnic groups. In doing so, it showcased the community's rich and diverse cultural heritage. Partnerships between cultural and community-based groups rooted in the African American, Haitian, Anglo, and Latino communities were important to the event's success. The cultural loop tour included fourteen churches, six civic institutions, and twenty-three additional historic sites, all welcoming passersby. A variety of artists projects--on utility poles, trees, sidewalks, and kiosks--lined the way. Each told a story of the people and the place. A vacant lot was occupied by the Open Door Project, displaying over one hundred used doors, painted and collaged in preceding weeks by people of all ages through workshops let by artist Sharon Koskoff. The spectacular collection of doors symbolized the people and events that helped open the doors of diversity and opportunity for individuals and the community. A "green" market featuring fresh, locally-grown foods, holiday craft show, and outdoor art fair were other attractions along the route, and Old School House Square near the center of the rectangle featured music and entertainment. Miami-based artist Gary Moore set up a temporary barbershop in a vacant house in the African American neighborhood, offering free haircuts and a glimpse into the world of Black hair for travelers on the loop. Delray Beach's Cultural Loop connected people in celebration of their own diversity. Although rapidly growing and predominantly prosperous, Delray Beach has ongoing healing and bridge-building work to do. The cultural loop was a unique event that helped locals to be tourists discovering their own hometown using familiar public spaces. At the same time, it gave visitors access to the diverse cultural riches and history of this south Florida beachside community. Including young people as meaningful contributors in the social and economic aspects of community building must not be overlooked and cannot be left to schools and parents alone. Engaging youth has a dual benefit: it brings more adults into the picture. Research in civic engagement by the League of Women Voters indicates that the factor most likely to get people more involved in community affairs is helping to improve conditions for youth. "Issues related to children, including mentoring and coaching, and education are those most likely to mobilize the untapped reservoir of volunteers." The Artists for Humanity programs in Boston does just that. It provides avenues for youth to become socially conscious and engaged entrepreneurs who bridge economic and cultural differences. Youth build confidence and gain business experience while working with professional artists as mentors and instructors. Artists For Humanity (AFH) began in 1990, when Susan Rodgerson, an independent artist, worked with students at Boston's Martin Luther King Middle School to paint a mural. After it was complete, six students asked her if they could paint something else. That summer they showed up at her studio every day as she found things for them to paint, eventually turning their attention to designing and producing T-shirts to earn money. In 1992, Rodgerson and the six students incorporated as a nonprofit. While they secured more commissions and product sales, the group developed studio production activities in graphic design, commercial photography, silk-screen printing, sculpture, theatrical set design, ceramics, and painting. The organization later added warehouse space for offices and a gallery. In 2004, AFH opened a state-of-the-art, environmentally friendly "green" facility with 23,500 square feet of studio, gallery, performance, and office space in Boston's Fort Point Channel Arts District. The organization works with youth primarily between the ages of fourteen and eighteen from all parts of the city. Fundamentally, it is based upon a small business model, concentrating on what young artists can creatively produce, rather than following a social service model that attempts to address their shortcomings. Young artists are paid and participate in client meetings and contract negotiations. AFH is careful not to draw boundaries between commercial arts and fine arts--art as personal expression and art as a product for sale. By embracing both, the organization encourages youth to tap their intrinsic creativity. Artists For Humanity operates as a structured, paid apprentice program to pair teens with experienced artists in a broad range of fine and commercial arts for product development and services to the business community. Participating youth represent the entire city and come primarily from low-income neighborhoods.The program employs roughly eighty young artists in its microenterprise programs each year and serves over three hundred through drop-in programs. The young artists receive an hourly wage and have the opportunity to earn a 50 percent commission on each individual work they sell through the gallery, shows, or negotiated contracts. T-shirts, murals, graphic design, and fine art works are the primary earned-revenue sources. While AFH has earned over $1.7 million since 1996, foundation grants and corporate sponsorships still account for the largest share of the organization's budget. When people become involved in the design, creation, and upkeep of places, they develop a vested interest in using and maintaining these spaces. When they have a true sense of "ownership" or connection to the places they frequent, the community becomes a better place to live, work, and visit. The residents' feelings of respect and responsibility for the place bonds them to that place and to each other. No architect or town planner can design or build a place that does that. "The sooner the community becomes involved in the planning process the better--ideally before any planning has been done," write Kathy Madden and Fred Kent of Project for Public Spaces in the book How to Turn A Place Around. "And people should be encouraged to stay involved throughout the improvement effort so that they become owners or stewards of the place as it evolves." Citizen involvement in public decision making is too often reactive and negative in character. People are inclined to involve themselves when the status quo is threatened. But citizen involvement is best when community members and grassroots organizations take the lead. Hope Community in Minneapolis stimulates the creative juices of its citizens in shaping and uplifting their community's self-image. The organization has not only made people believe great things are possible but also it has already accomplished many great things. Through an asset-based community-organizing strategy and "listening process," Hope Community brought people of multiple ethnicities together in small-group dialogues. Hope has organized three major listening projects--each including more than three hundred adults and youth--focused on jobs and education, the meaning of community, and the design of a park. In fact, the organization has designed an entire neighborhood with concern for children as the unifying factor based upon what it learned from listening. Engaging people through their cultural traditions and involving artists as catalysts have become key parts of Hope's strategy. The Phillips neighborhood just south of downtown is the poorest and most racially diverse of Minneapolis's eighty-six neighborhoods. It serves as home to a long-standing and politically organized Native American community, as well as burgeoning Latino and East African immigrant communities. Hope Community, Inc., is a community development corporation steeped in a tradition of "creating not just housing but community." As of 2005, Hope owned and managed 89 units of housing and over 6,500 square feet of community space, with plans in motion for 250 more units and 20,000 square feet of new commercial space. Hope embraces active listening and a cultural focus in all it does. In 1997, Hope began its Listening Project to help learn about residents' ideas on education and jobs. More than thirty dialogue groups helped deepen Hope's relationships with the community and its understanding of these issues. A larger project with over three hundred participants, including many youth, later focused on the meanings, struggles, and hopes people attach to neighborhoods and communities. These discussions led into a project to redesign Peavey Park, an underutilized, crime-ridden park that the Minneapolis Park Board had scheduled for an overhaul. The listening and visioning process enabled Hope to engage broad-based participation and to recognize that building community was the central purpose of the park. Hope arrived at the design through a series of creative workshops that were later translated into a formal design and adopted by the Park Board. As Hope brought together what it learned with its core activity of creating a safe environment for children, it embarked on a bold project to envision a larger community it called Children?s Village. The organization commissioned professional planners to draw up designs for this sixteen-block area and presented them to city leaders and the media. In 2003, Children's Village Center opened. It is a four-story, thirty-unit, low-income housing complex that includes offices for a staff and a community center. It sits prominently as the first of four developments at the intersection of two major city thoroughfares. When complete, these well-designed centers of community activity will signal a massive turnaround for a neighborhood long infested with drugs, poverty, and hopelessness. Some people have argued that social capital--the volunteer organizations and efforts that provide the glue in any community--has eroded steadily over the past two generations, as seen by the drops in participation in social and civic groups. This crisis may really be one in which the old tools for involving people in civic issues are no longer sufficient to meet new challenges. The tools may have lost effectiveness as the population diversifies. At the same time, many social, civic, and cultural functions have been "professionalized" in ways that exclude participation of ordinary citizens. From community to community across the United States, professional arts organizations have grown up where voluntary groups once stood. This trend has severed the practice and experience of the arts from day-to-day life. Participation in cultural activities (as opposed to spectatorship) connects people to each other and to their community institutions, providing pathways to other forms of participation. Thus, arts and culture can create opportunities for political expression, community dialogue, shared cultural experiences, and civic work. Within the arts, there is a vital yet lesser-known field of practice that strives to develop cultural understanding and civic engagement. Community-based arts practitioners bring members of a community together to solve problems, build relationships, and get involved in ways that rebuild social capital. In rural Danville, Vermont, artists and highway planners engaged citizens to solve a road construction dilemma. The Danville Transportation Enhancement Project found a unique way to identify and resolve touchy issues of values and aesthetics. Danville is a community of 2,200 people in the northeastern part of Vermont. It sits on U.S. Highway Route 2, part of the National Highway System and one of the major east-west roads across northern New England. With the White Mountains as a backdrop, Danville boasts some of New England's most unspoiled and spectacular scenery. The town is anchored by a classic village green with a Civil War monument, bandstand, distinctive school, general store, courthouse, and churches. The Danville Village Improvement Society was formed in 1896 to beautify the town. The following year it placed an elegant stone watering trough on the green, an amenity still in use today. The society also installed street lamps and planted rows of shade trees on the green and along the streets surrounding it. The past one hundred years have brought little change to the town and its appearance. The purpose of the Danville Transportation Enhancement Project was to plan for the redevelopment of a portion of U.S. Highway 2 through the town's village center. The Danville project needed to find a way to upgrade road conditions and meet federal highway requirements, while respecting the aesthetic, economic, and cultural fabric of the community. Highway expansion in a rural area, where the most valuable currency is often aesthetic, can be difficult and controversial, pitting residents, businesses, local officials, and state officials against each other. Many quaint towns and villages have lost all sense of place and have been economically and socially devastated by such expansion. The Vermont Agency of Transportation (VTrans) is a leader in the national movement among transportation agencies toward context-sensitive design solutions and public involvement. Vtrans aims to bring communities together early in the planning process to help design environmentally responsible transportation infrastructure that promotes safety and efficiency while preserving the community's vision of itself. A local review committee was formed as part of the legislated highway planning process. Two artists were selected--landscape architect David Raphael as lead artist and sculptor Andrea Wasserman--to joining the local review committee. The Danville project implemented the principles of context-sensitive design and the time-honored Vermont traditions of public meetings, civil discourse, and representative democracy. Artists, working closely with engineers and residents, infused the process with creative problem solving and openness to new ideas. Raphael and Wasserman led community meetings, interviewed residents, and circulated questionnaires. They helped residents envision the future of the village and its central green, and they took the community through a review of preliminary VTrans designs. The civic engagement process was the most important aspect of the project. It was purposefully inclusive, sensitive, engaging, and ongoing. Having artists, rather than highway engineers, lead the process seemed less threatening to community participants, and they were more effective at devising satisfying alternatives. A final design and enhancements were presented to the Danville community in late 2002. Construction and completion are scheduled through the latter part of the decade. Enhancements include gateways with signage, lighting, landscaping, granite posts, and sidewalk markers to alert motorists that they are entering a village center. Streetscape designs reinforce the village character and improve aesthetics and pedestrian comfort. Almost as important as the road design, a number of related activities emerged from the community process, especially those involving youth? -- projects that got started right away. They include a student photography project that led to postcards and a Danville calendar. Other students carved stone figures to be embedded along three miles of concrete sidewalk. Youth planted seedlings in the project's right-of-way, and they designed tile markers, a ceramic playground mural, and clay cutouts of hands to hang in the village green. Putting a team of artists at the helm of highway design may seem risky. However, when the most difficult part of highway construction is sorting out and negotiating individual and community values, feelings, and aesthetics, it makes sense--and it works. The Danville Transportation Enhancement Project made everyone an expert in highway construction. In so doing, the Danville project met the needs of local residents and the state highway department. Community members of all ages gained a new understanding of the function and possibilities of highways, as well as a greater understanding of what they can do when they work creatively together.